Our studio is situated near the centre of Buckingham and provides a custom built facility designed specifically with the production of online media in mind. 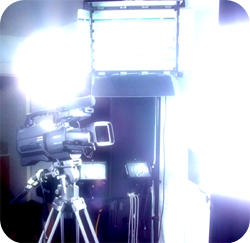 The studio is setup with backdrops and lighting for green or blue screen video work but also provides black and white backdrops more usually used for photography. Our production prices are cost effective enough to be completely affordable by the smallest businesses. We own all our production kit, so you don't pay extra for us to hire expensive equipment. Green screen video techniques can be used to create the illusion of background scenery. Once the video is shot, the green background is removed and replaced with an alternative background - perhaps a photo, a graphic or another video. We also provide photography services from the studio, generally for product promotion shots and web site photos. We shoot using the latest Canon 7D and lenses with flash kit.